The IAB’s performing arts courses draw students from all over the world to its home in Sitges, just 30 minutes away from Barcelona’s La Rambla and a short bus ride to the city’s major international airport. It is a fitting location for studying the arts, because when a new student first arrives in this atmospheric town on the Catalan coast, they join a long and illustrious list of fellow artists who have made Sitges their home. At the beginning of the 20th century Sitges was a mecca of the modernist movement. Faces as famous as Picasso, Dali and Miro were once to be found walking the old town’s beautiful streets. Artists, writers and intellectuals arrived from across Europe and beyond to investigate the exciting new form. Many of them stayed to share its proponents’ bohemian, counterculture lifestyle, and, most probably, its wonderful beaches! And Sitges has held on to its reputation as an outward-looking, open-minded haven for fresh thinking artists to this day, IAB students enjoy the relaxed and friendly nature of the town, with its relatively low cost of living and excellent quality of life. The town’s status as a celebrated European destination with a strong cultural identity has been reinforced by the presence of IAB, with its network of international connections and the new breed of talented young artists who are arriving at its doors. 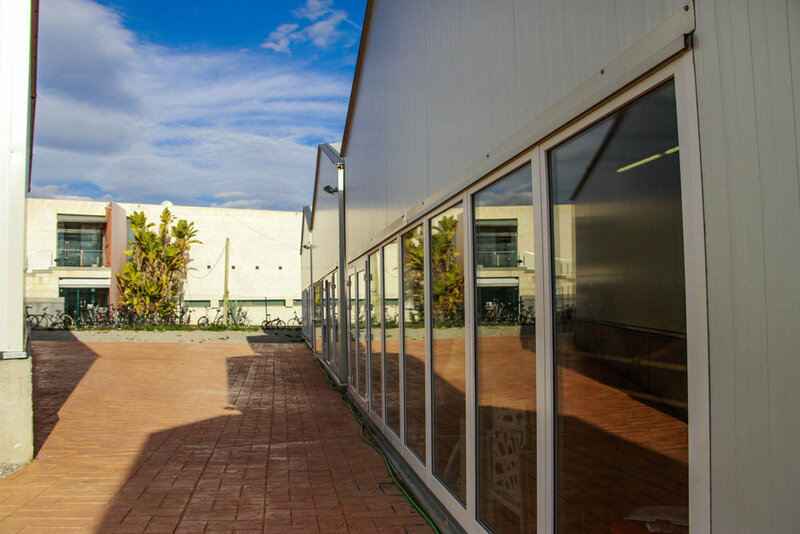 The impressive modern exterior of IAB’s campus beside the Mediterranean is a perfect match for the high-quality facilities inside. Dance studios flooded with natural light, ultra-modern rehearsal spaces, shimmering glass-fronted music rooms and open courtyards thronging with young dancers, actors and singers create an inspiring atmosphere for our performing arts students. All of IAB’s learning spaces are equipped with first class technology, from the computers in the study centre to the lighting rigs and sound system inside our own 200-seat theatre. We make the most of the excellent facilities, students are able to access them for study for at least 12 hours a day, and there is weekend access too. To be fit for purpose the IAB campus was designed to encourage and accommodate individual brilliance and collaborative excellence, high energy and calm reflection - often over a coffee or some healthy home-made food in the cool, campus cafe. The result is a world class learning environment. If you would like to see our campus for yourself and learn more about any of our courses, we’ll be happy to show you around. Contact us to arrange a visit.